Bower JK, Lazo M, Juraschek SP, Selvin E. Within-Person Variability in High-Sensitivity C-Reactive Protein. Arch Intern Med. 10.1001/archinternmed.2012.3712. eFigure. Bland–Altman Plots of the Difference in CRP (mg/dL) Between Measure 1 and Measure 2. C-reactive protein (CRP) is a marker of systemic inflammation and cardiovascular disease.1-3 Based on findings from recent clinical trials, CRP has been recommended as an adjunct screening tool to stratify cardiovascular risk in the general population.4 However, evidence regarding within-person variability of CRP in the general population is limited. Short-term variability in CRP has important implications for its use and interpretation in clinical practice and research studies. Thus, the objective of this study was to evaluate the short-term, within-person variability in CRP measurements and to quantify the impact of repeated testing on CRP-based cardiovascular risk classification. The Spearman rank correlation and intraclass correlation (ICC) coefficients, and the within-person coefficient of variation (CVw) were used to characterize short-term, within-person variability.6 A persistently elevated CRP level was defined as CRP level of at least 10.0 mg/L at both examinations. We used scatterplots and Bland-Altman plots to visually display measurement variability.6 Finally, we calculated the percentage of participants whose risk category was reclassified owing to repeated testing. The mean (SD) age of participants was 38.0 (16.5) years. Fifty percent of the study population were female, and 48% were of non-Hispanic white race/ethnicity. The mean time between examinations was 18.9 days. The mean CRP level was 4.5 mg/L (95% CI, 3.9-5.1) at the first examination and 4.3 mg/L (95% CI, 3.8-4.9) at the second examination (P value for the difference, .45). The Spearman rank correlation between visits was 0.65, the ICC was 0.77 (95% CI, 0.69-0.84), and the CVw was 46.2% (95% CI, 42.9%-49.3%). The high variability in CRP can be seen visually on the scatterplot (Figure), although the Bland-Altman plot shows that most of the discordance between examinations occurred at higher values (>10.0 mg/L) (eFigure). The variability was particularly high among persons with CRP levels greater than 20.0 mg/L. The prevalence of an elevated CRP level of at least 10.0 mg/L was 10.5% at the first examination and 10.4% at the second; 7.2% of participants had persistently elevated CRP levels (eTable). Of those with a normal CRP level at the first examination, only 3.5% had CRP levels of at least 10.0 mg/L at the second. Of those with CRP levels of at least 10.0 mg/L at the first examination, 32% were reclassified as having CRP levels lower than 10.0 mg/L at the second. The prevalence of a CRP level of at least 20.0 mg/L at the first examination was 4.3% and was 2.8% at the second; 1.5% of participants had CRP levels of at least 20.0 mg/L at both examinations, representing an approximately 65% decrease in prevalence. In this sample of the general population, we observed significant short-term (approximately 2.5 weeks) within-person variability in CRP levels, particularly at high values. Approximately one-third of persons with elevated CRP levels were reclassified as having normal CRP levels after repeated testing. 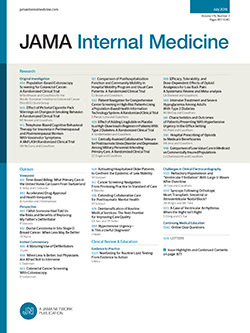 Our results are consistent with those of previous studies conducted in small selected populations (eg, patients with ischemic heart disease) or in which measurements were months or years apart.7,8 Of note, we observed greater variation at higher values in cases in which clinicians are most likely to intervene. The 2010 American College of Cardiology Foundation/American Heart Association guidelines for the assessment of cardiovascular risk in asymptomatic adults includes recommendations for CRP level to select patients for statin therapy when the low-density lipoprotein cholesterol concentration is level than 130.0 mg/L.9 Our results suggest that use of a single CRP measure for riskstratification may lead to substantial misclassification. Recommendations for repeated testing to confirm elevations in CRP level prior to altering medical decision-making may be warranted, particularly among those with CRP values near the risk cut points. Correspondence: Dr Selvin, Welch Center for Prevention, Epidemiology and Clinical Research and the Bloomberg School of Public Health, Johns Hopkins University, 2024 E Monument St, Ste 2-600, Baltimore, MD 21287 (lselvin@jhsph.edu). Author Contributions: Dr Bower had full access to all the data in the study and takes responsibility for the integrity of the data and the accuracy of the data analysis. Study concept and design: Bower, Lazo, and Selvin. Analysis and interpretation of data: Bower, Lazo, Juraschek, and Selvin. Drafting of the manuscript: Bower. Critical revision of the manuscript for important intellectual content: Bower, Lazo, Juraschek, and Selvin. Statistical analysis: Bower and Selvin. Obtained funding: Selvin. Study supervision: Lazo and Selvin. Funding/Support: Drs Bower and Juraschek were supported by National Institutes of Health/National Heart, Lung, and Blood Institute grant T32 HL007024.